Even in modern Hanoi you can still see plenty of old Vietnam. 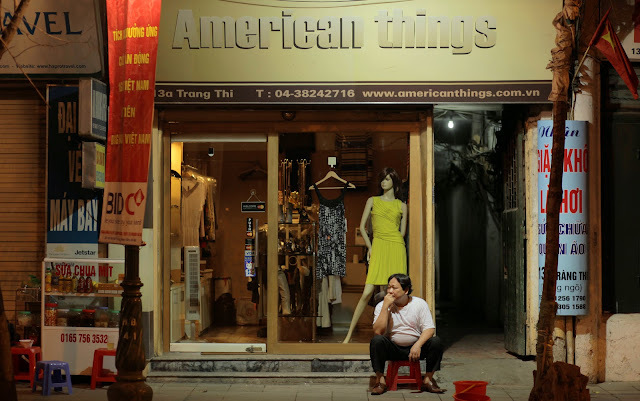 And some strange, new Vietnam. Vegetarian pho, Vietnamese pancakes, and lots of spring rolls. Traffic lets up at night. 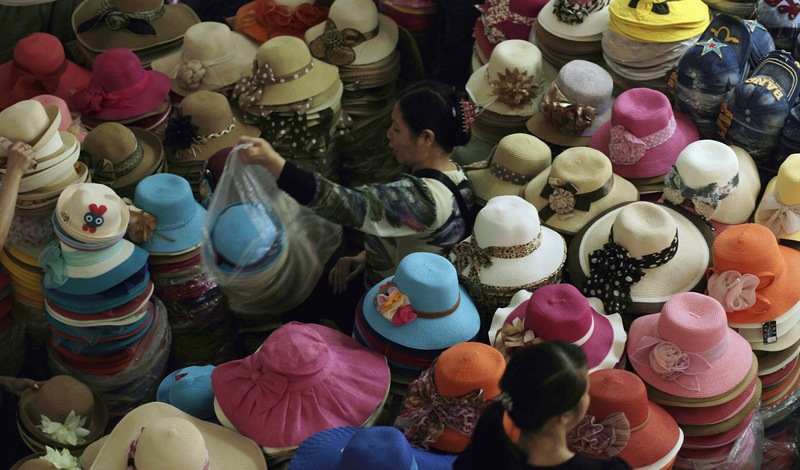 A hat merchant in the market. 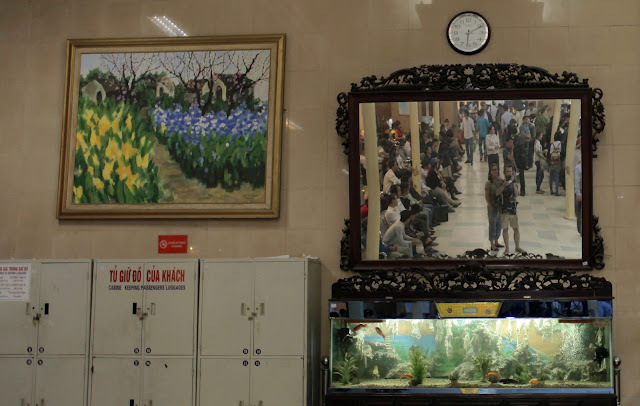 Self-portrait in a mirror in Hanoi Railway Station. A chow guards his duck friends. This guy has his finger on the pulse of what America is all about. 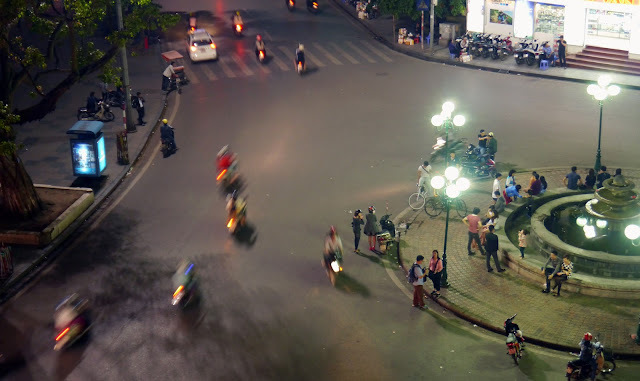 Turtle tower and some of Hanoi's old quarter at night. 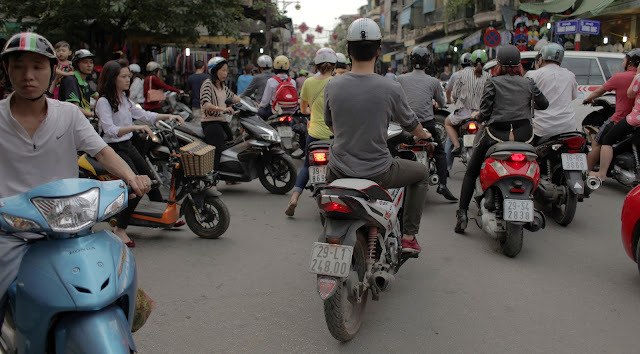 Hanoi immediately hit us with that exciting otherness we have come to expect arriving in a new place. It's kind of similar and recognizable, but different enough to keep us on our toes. The biggest surprise? People really do walk down the street wearing those conical hats! We had arrived early we immediately set out to wander the streets. Once we finally got a handle on the traffic patterns we could relax and enjoy the bustle of every different type of commerce transacting simultaneously. As we wound down the small lanes of the old quarter, we walked past temporary, makeshift food stalls that have probably operated in the same place for decades. 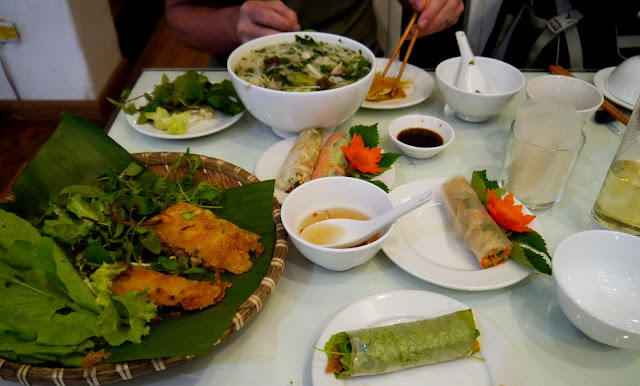 We found a delicious vegetarian place (since most of the street food stalls are meat or more meat) and then a local bar to enjoy some Bia Ha Noi (Hanoi Beer). We were a little frustrated that we would only have a couple days in town, and that we had to spend part of one day in a cafe that had wifi booking our next week. It's hard to be unorganized with time constraints! I have more respect for the two week tourists who actually manage to fit in all the sights. I'm exhausted thinking about it.